Some sites gleaned on a recent trip, Part IV, Richmond & Newport News, Virginia. Episode: 55. Site Numbers: 048, 070, 266. Date Posted: 20 December 1997. Update 16 March 2000. Location: Richmond & Newport News, VA, USA. Type: Museum, Aircraft, Art. Next on my trip was a stop at the Virginia Aviation Museum (070), 5701 Huntsman Rd, Sandston, VA 23150-1946 (Tel: 804-236-3622) http://www.smv.mus.va.us/ On the periphery of the Richmond International Airport. 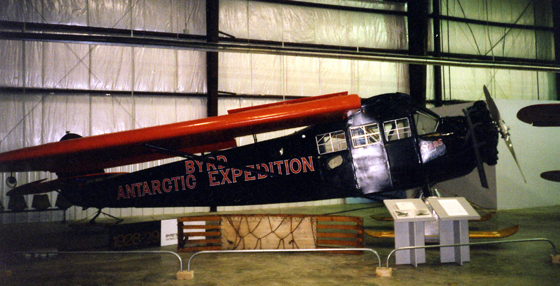 I had heard that the Stars and Stripes, a plane used by Richard Byrd during his first Antarctic expedition, was here. Sure enough, there it sits, restored and nicely displayed along with a number of other vintage aircraft. In front of the plane is yet another dogsled! The explanatory plaque reads: "On January 15, 1929, this Fairchild FC-2W2 became the first aircraft to fly over Antarctica [this honor more accurately falls to Sir Hubert Wilkins who flew over parts of the Peninsula the year before]. Stars and Stripes was one of a complement of three aircraft Commander Byrd took with him on his first expedition to the bottom of the world. The other aircraft were a Fokker Universal, the Virginia, and the Ford Trimotor Floyd Bennett, which made the famous flight over the South Pole. 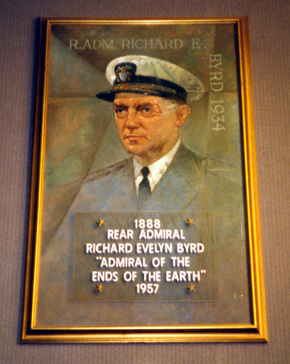 Among Byrd's achievements aboard the Stars and Stripes was the discovery of the heretofore unknown mountain range which he named after the Rockefellers. There was also the rescue of the Virginia's hapless crew after the Fokker was destroyed on the ground by high winds while out on a survey mission. The Stars and Stripes provided stalwart service throughout this expedition and the 1934 expedition setting out caches of fuel, food [and] equipment as well as flying scientific survey missions. When Stars and Stripes was shipped back to the United States, it had flown a total of 187 grueling Antarctic hours. The aircraft was subsequently used by different owners as a barnstorming ship, a crop duster, photoship and hangar queen. Fairchild eventually took ownership again and in 1962 donated Stars and Stripes to the Smithsonian. Stars and Stripes is a loan of the National Air & Space Museum in recognition of this museum's location on what used to be known as the Richard Evelyn Byrd Flying Field." The Museum also has in its collections, although not on display, such Byrd artifacts as a parka, gloves and a sun compass. I had been told by several people that there was no longer anything associated with Byrd at the nearby terminal building at the Richmond International Airport (266). As the airport was earlier named for Byrd, I figured there might still be something there, a plaque or display of some sort, so I decided to have a look anyway. With the parking meter ticking away, I rushed around the terminal until quite by accident, on a stairway landing, I found two large oil paintings of Byrd, hanging opposite one another. The plaque below the first one reads: "oil painting of Admiral Richard E. Byrd, donated to the Capital Region Airport Commission and to the memory of a great Virginian by Milton Glaser Associates, Richmond, Virginia, 1974." 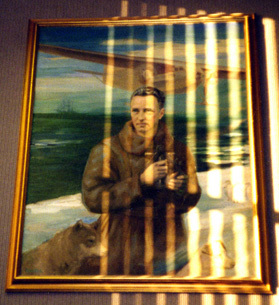 The second, more interesting one is noted as follows: "Oil painting of Admiral Richard E. Byrd. Captain Charles L. Kessler, accompanied Admiral Byrd on first three expeditions to the North and South Pole. Loaned by Rita Kessler Barte." 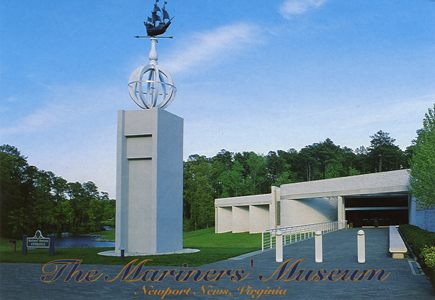 My next destination was The Mariners' Museum (048), 100 Museum Drive, Newport News, VA 23606-3759 (Tel: 800-581-7245) http://www.mariner.org. This is a large and modern institution with some very interesting and well executed exhibits; however, I was disappointed in finding nothing related to the Antarctic. In the library, however, there is a reasonably large collection of fairly standard Antarctic books. The one manuscript with an Antarctic connection that I did look at was the journal of Lt James Alden who served on the Vincennes during the Wilkes expedition. It covers the period from Wednesday, August 7, 1838 (when Alden reported for duty at nearby Norfolk) and ends on Sunday, May 22, 1842. A number of pages have been removed at the end but perhaps they had no text. The entry for January 28, 1840 reads: "At 9.45 A.M. discovered land." The Antarctic continent perhaps?